Our new subscription service can seamlessly integrate fresh greens into any existing foodservice operation, or support a hyper-local CSA program. The best part? There’s no farmland or additional staff required. Today (September 12th, 2018) we announced the addition of Grown by Freight Farms to our product line! Grown is an on-site vertical farming service where we install the Leafy Green Machine™ on your site and operate it from top to bottom. So, what does Grown include? It’s simple: Our Grown clients get a farm at their location, a dedicated farmer to manage operations, and all of the sustainable and local produce that comes out of the farm! Remind me, what’s this farm you’re referring to? Freight Farms builds hydroponic container farms called Leafy Green Machines. These farms are controlled environments, so farmers can depend on consistent costs and quality year-round, regardless of season or weather. Leafy Green Machines can be installed mere steps from the plate, drastically reducing food-miles. They consume just five gallons of water per day or less, and require no major construction to deploy. How do I know if Grown is for me? If you work at a corporation, university, residential community, hospital, or any other organization committed to food transparency and wellness, this program is for you. Grown is perfect for any foodservice operation, employer amenity package, or produce supply chain because it provides beyond-local greens without the need to train or hire additional staff. With Freight Farms handling all the operations, clients can choose what to grow, and how that produce will be distributed after harvest. Who is currently using Grown? 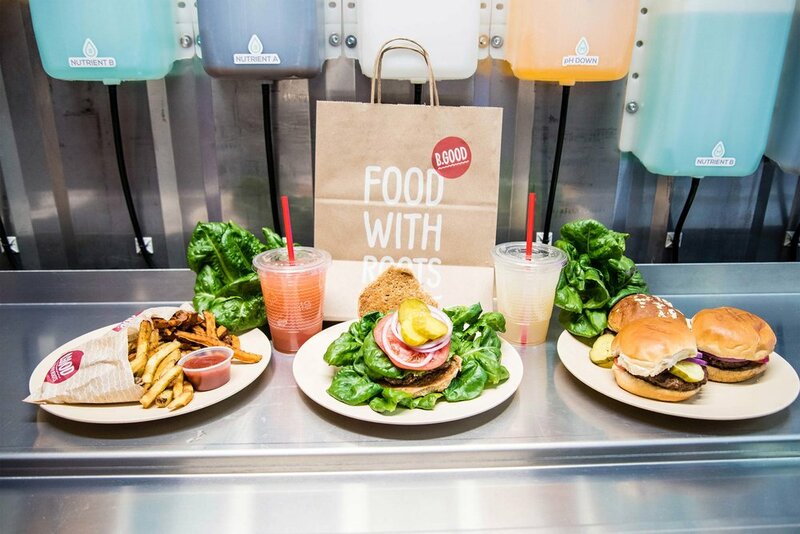 The new Grown program is already supplying B.GOOD, a Boston-based farm-to-table chain restaurant, with lettuce for its popular Cousin Oliver Burger served throughout the Northeast. Meanwhile, 3D design software company Dassault Systèmes enjoys a thriving CSA program for employees at its Waltham, MA campus. Freight Farms is currently accepting new Grown clients in New England, with plans to roll out to major cities nationwide in 2019. Want more details? See the full press release, check out the Grown page, or contact us!